The question of how to generate as much attention as possible on social media has become a whole field of studies nowadays. However, it turns out once again the simplest thing can attract the most attention, in this case a simple picture and the will to break a record is enough to mobilize millions of people. Sometimes it's the simple things that inspire you. Apparently, that's what some Instagram users thought and that's how an image of the former "like" champion Kylie Jenner is now sitting in second place. But the new like champion is not a sophisticated picture with a complex background story or a beautiful model. It is nothing more than an egg against a white background. 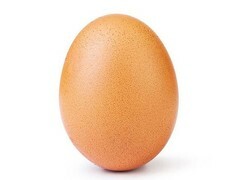 But how did this egg manage to accumulate nearly 50 million likes? Apparently the creator of the egg post just got tired of seeing Kylie Jenner in first place and published the egg image on the Instagram page 'world-record-egg' under the same name. In the picture description, the creator also explicitly points out that the egg post has the sole purpose of removing Kylie Jenner's post from the top spot. With almost 50 million likes he absolutely achieved his goal, as the picture of Kylie Jenner in question has amassed "only" 18 million likes. This example shows once again that the Internet is not really predictable and its users often have quite a sense of humor.